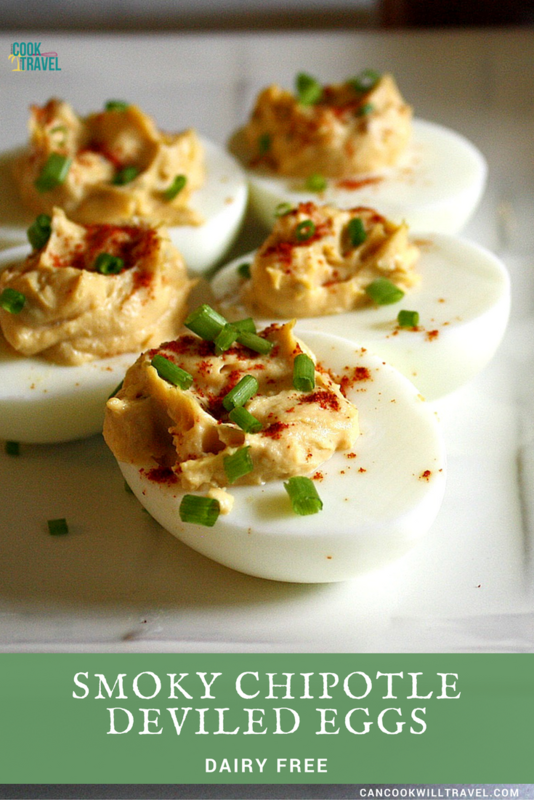 I feel like deviled eggs are kinda polarizing, because it seems like you either love them or hate them. I love them, and I’ve been a pro at making them since I was a kid. And when I think of Easter, which is almost here, I think of making them. 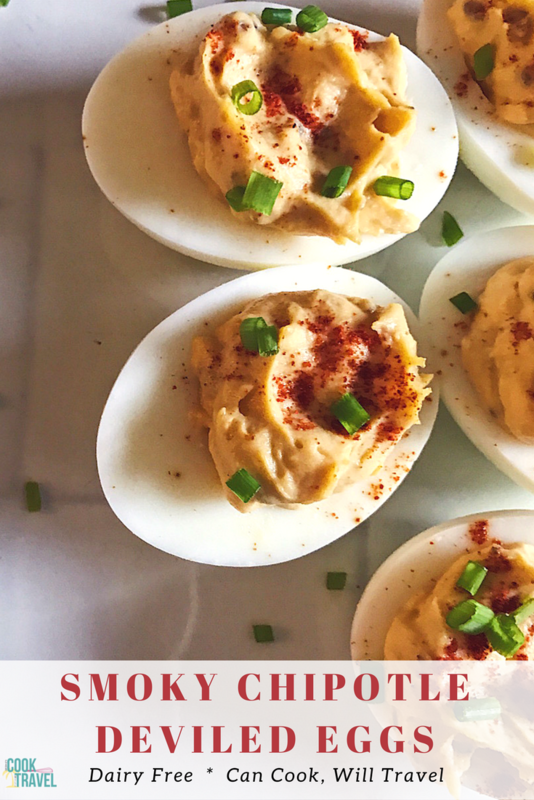 And all of the sudden these Smoky Deviled Eggs were all I could think of. I love my mom and how she encouraged my love for cooking at a young age, because my sister and I helped in the kitchen all the time. At an early age, I was the go-to cheese sauce creator, French toast cooker, and deviled eggs maker. I had no recipe for any of these dishes, and would just create everything upon feel and taste, and it’s a skill that I’m really grateful for. When it comes to making deviled eggs, I’ve always created them in the traditional Wallace way. But I was in the mood to do a bit of experimenting, and I couldn’t shake this idea I had for Smoky Deviled Eggs. Recently I made some of my Southwest Chicken Fajita Wraps, and that left me with some extra chipotles in adobo sauce. I knew exactly what I wanted to try in my deviled eggs, and I was pretty excited about it. Off I went to go hard boil some eggs, and I love the method I use for hard boiling them. 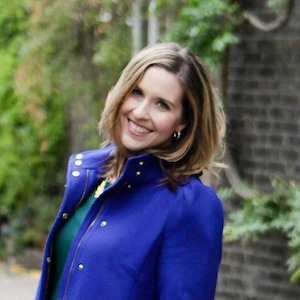 If you don’t have a way you have much luck with, check out my method here. One big time saver involves peeling the eggs as soon as they cool, which has pros and cons. It sure cuts down on making them when you already have the right number of eggs that peeled well, but the shell helps protect the egg to keep it nice and round. So it’s up to you. Once you peel the eggs, just cut them in half and carefully pop the yolks into a food processor. I like using a non-serrated knife so the egg white doesn’t have knife marks in it. And I always wipe the knife off after slicing through each egg, so that each egg looks nice and clean. Once all of the yolks have been removed, then add some mayo, dijon mustard, pepper, chipotle in adobo, and dill pickle relish. Process away until the mixture is nice and creamy, and add more mayo if it’s not smooth enough. Definitely taste and add more chipotle or some salt or mustard to the mixture if needed. Finally you’ll spoon the chipotle egg mixture into each egg half until they’re all full. Top the eggs with a sprinkle of smoked paprika to carry on the smoky notes and then some chopped chives for a fresh bite. 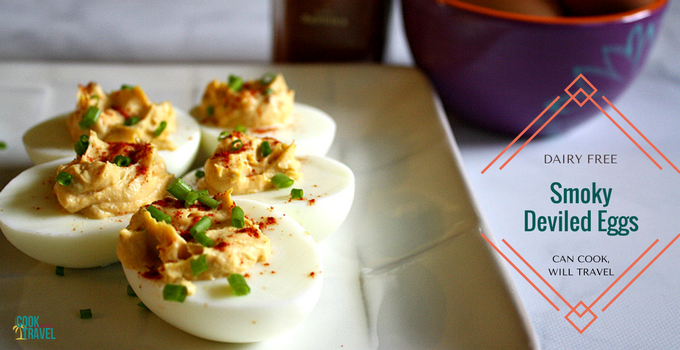 I’m so excited for you to try these Smoky Deviled Eggs. They are seriously delicious with the smoked flavor yet still fresh and oh-so-good! Click that link for the recipe and step by step instructions! Happy egg making! Two years ago: Pimento Cheese . . . It’s New to Me!